Petit Pains au lait which means small or little milk breads, these bread rolls are our favourite. Usully we get them from bakeries or else from stores.My kids love this milky oblong bread rolls with nutella spread or else simply with butter and jam. Seriously my kids can have them everyday without any fuss for their breakfast or for their snacks with their dose of warm chocolate or milk. These small milk bread rolls are very simple to bake at home. The dough for making these pains au lait is slightly rich but not as rich as brioche dough. 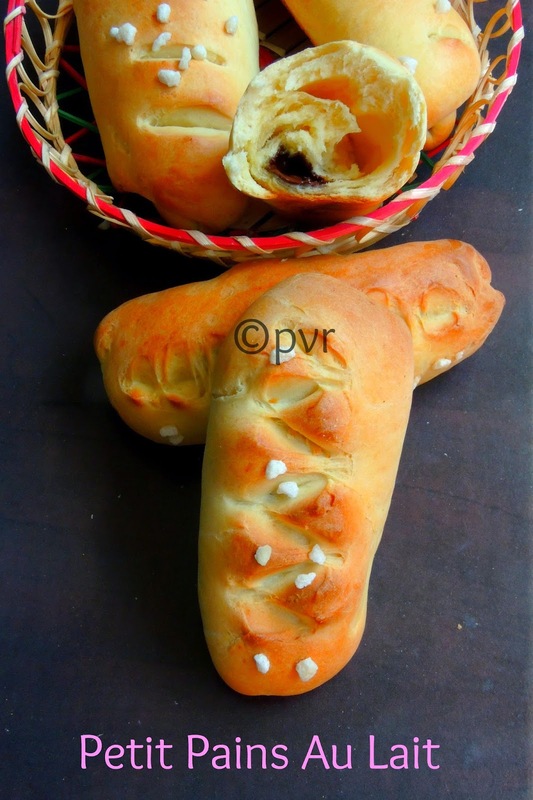 The dough is prepared only with milk and water or anything else as liquid is avoided for making this cute bread rolls. Generous amount of butter is used in this pains but still not too much as like in Brioche dough. Pains au lait typically have just a hint of sweetness in them. Once baked they gets a beautiful golden brown on the outside and almost flaky inside because of the way the dough is rolled and shaped. Once rolled and arranged, they are decorated by curring through the top with scisssors in a way which gives a beautiful pattern typical of these French milk bread. Actually i thought these pains au lait are loaded with eggs as they smell eggy whenever we get them from bakeries. For our this month's We Knead To Bake, a monthly baking event by Aparna of My Diverse Kitchen, we baked these French pains au lait as eggless one.Also am running blogging with Yeasted breads as theme, obviously these petit pains au lait suits prefectly for the theme.Check out the Blogging Marathon page for the other Blogging Marathoners doing BM#40. Put the warm milk, yeast and sugar in the food processor,mix well. Then add all the flour and the salt and run the processor until it looks crumbly. Add the butter and knead until you have a soft, smooth and elastic dough not sticky. Add a little more milk, if your dough is dry, until you have the required consistency of dough. Shape the dough into a ball and place it in an oiled bowl, turning it over to coat with oil. Cover loosely and set aside to rise until double in volume. This should take about 1 1/2 hours. Turn the dough out onto your working surface. You shouldn’t need any flour, but if you feel the need, just lightly dust your palms with it. 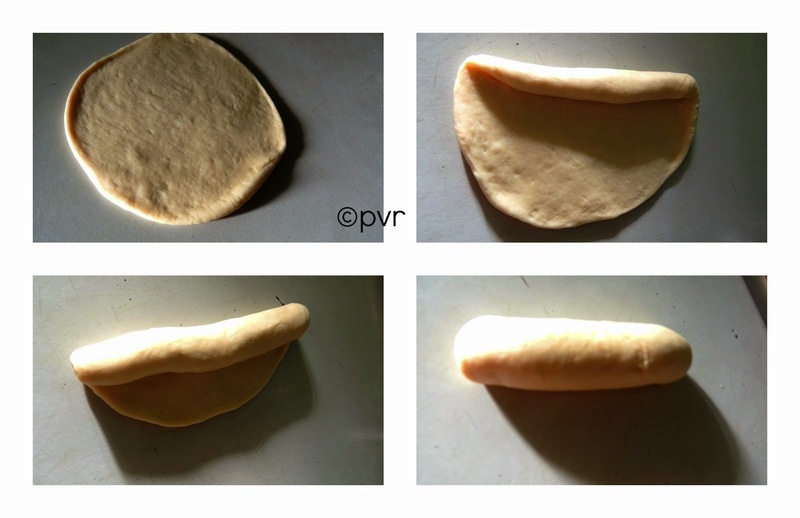 Deflate the dough gently, and divide it into 10 equal pieces. Let them rest for 15 minutes. Roll out each piece of dough, one at a time, into a circle about 4 in diameter. (i place some chocolate chips).Slowly roll up the circle from one end into a cylinder. Pinch the seam closed neatly, and place them on a greased or parchment lined baking sheet with the seam side facing down. Cover loosely and let them rise for an hour or so till almost double in size. Brush them lightly with milk and using a pair of sharp scissors, make diagonal cuts not too deep on the top of the rolls. Sprinkle pearl sugar/ granulated sugar. Bake them at 400F for about 15 minutes or so until they are golden brown. Let them cool on a rack. Serve them warm or at room temperature with coffee or for breakfast..
Love how these rolls have turned out and the texture of them. looks super yummy!!! such a perfect texture!! I have not yet done this.. hoping to make it!! Looks awesome! 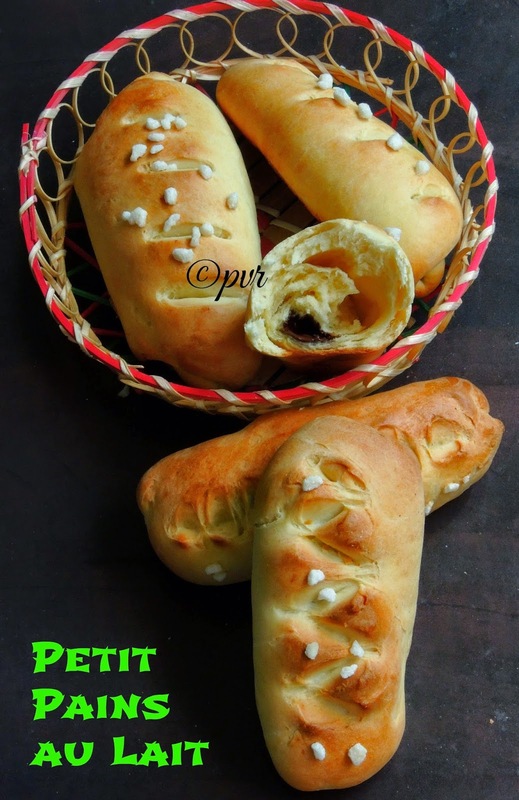 Lovely bread and it is perfect for the evenings with a cup of coffee! can we prepare without gluten. I can get just plain flour. looks so yumm.so perfectly done.I too can have this everyday.. These look so soft and spongy inside I love the golden brown colour on top.Lovely recipe and perfect for breakfast. Ur bakes are too good!! Lovely rolls. They turned flaky and perfect. They look great. Flaky and light! looks super soft & yummy!! Love these french rolls they look so flaky and perfectly done. Perfectly baked rolls. Love the flecks of butter on top. Super Perfect Rolls! Awesome bake! Yummy looking buns. They look so buttery and flaky. I am going to try these Priya, they seem so much simpler than Hakaido breads. Beautifully made. I still have to make them.Loos awesome.